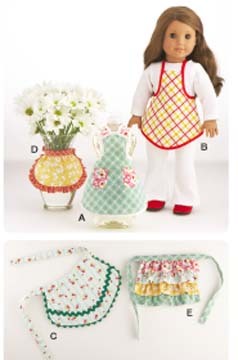 Mini aprons is a one size pattern. Aprons can be used on bottles, vases, dolls, tied together as a garland or decoration! View A Apron has contrast fabric neck strap and optional pockets. Outside edges are finished with bias tape and ties are from bias tape. View B Apron has all outside edges finished with bias tape and ties are from bias tape. View C Apron has waistband with ties, decorative rickrack trim on front and outside edges finished with rickrack. View D Apron has ruffle on outer edge and waistband with ties. Apron front is from contrast fabric. View E Apron has waistband with ties and four overlapping ruffles attached to panels. Apron is made from four different fabrics.